Her book is alarming but not alarmist, controversial but evidential, impassioned but rational." "This is the best book of the year. Its argument has already been used in at least one graduate course, and it will be a topic of common conversation—as it deserves to be. If you read one work of nonfiction a year, make this the one." When Americans see people of color doing most of the menial jobs, dying younger from most diseases, and filling most of the prison cells, it seems, to many, that race intrinsically and inevitably divides us into separate types of people. In centuries past, scientists invented a biological concept of race and claimed it was an essential feature of human identity. Though the Human Genome Project proved a decade ago that human beings are not naturally divided by race, an emerging technologically driven science is resuscitating race as a biological category written in our genes. Examples are both far-reacing and disturbing: Researchers are developing a genetic definition of race based on statistical estimates of gene frequencies--estimates that conveniently mirror eighteenth-century racial typologies. The pharmaceutical industry promotes race-targeted therapies. Law enforcement uses stop and frisks, which disproportionately target African Americans, as a way to capture cheek swabs that build DNA criminal databases. And a proliferation of for-profit ancestry-testing services would have us believe that spitting into a test tube will tell us not only who we are but "what" --that is, what race--we truly are. In this provocative analysis of race, science, and politics, leading legal scholar and social critic Dorothy Roberts exposes how race as an archaic belief system--justified by cutting-edge science--undermines a just society and promotes inequality well into the twenty-first century. A decade after the Human Genome Project proved that human beings are not naturally divided by race, the emerging fields of personalized medicine, reproductive technologies, genetic genealogy, and DNA databanks are attempting to resuscitate race as a biological category written in our genes. In this provocative analysis, leading legal scholar and social critic Dorothy Roberts argues that America is once again at the brink of a virulent outbreak of classifying populations by race. By searching for differences at the molecular level, a new racial science is obscuring racism in our society and legitimizing state brutality against communities of color at a time when America claims to be post-racial. Moving from an account of the evolution of race—proving that it has always been a mutable and socially defined political division supported by mainstream science—Roberts delves deep into the current debates, interrogating the newest science and biotechnology, interviewing its researchers, and exposing the political consequences obscured by the focus on genetic difference. 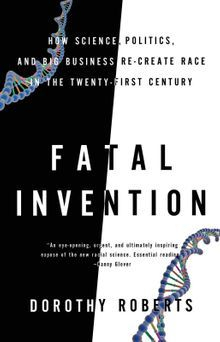 Fatal Invention is a provocative call for us to affirm our common humanity by ending social inequality preserved by the political system of race.